A serial killer who kills serial killers, by now just about everyone knows the premise behind this show. Dexter Morgan a Forensic blood specialist for the Miami Metro Police Department is, in a secret life, a serial killer, but the catch is Dexter only kills other murderers. What could go wrong with a show like this? It seems almost too good an idea to mess up, however somehow this show manages to do just that. 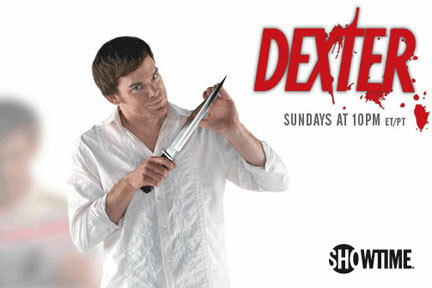 The show starts out really good with Dexter stalking and killing his prey while a larger story unfolds around him. The story seems really exciting but then the shows focus shifts off of Dexter’s “pastime activities” and on to this larger story and his personal life. Exposition in television shows is usually a good thing, because the action overwhelms the story element of the show. But in Dexter the series begins to focus all of its attention on the story portion and give us none of the action. This shift in the focus of the latter part of the first season and almost the entire second season nearly cripples the show. All in all Dexter is a decent show with interesting yet overly long story arcs. I haven’t seen past season two, so I really can’t say if what the show will focus on next, but at this point it seems like it has nowhere else to go but up. If you are at all interested in this show and haven’t checked it out already I would recommend it. Despite all my hang ups with the story it actually is really quite good, with solid acting and an engaging premise it manages to keep up its entertainment value.